Attorney General Matt Denn announces plans to increase use of the state’s Criminal Nuisance Abatement law. 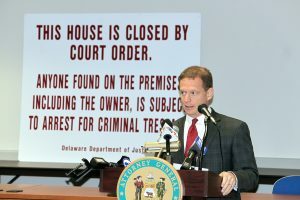 Attorney General Matt Denn announced Thursday that an initiative to partner with law enforcement agencies to accelerate use of the state’s Criminal Nuisance Abatement statute has shown significant results, including a substantial increase in the number of legal actions taken against properties where criminal nuisances have been occurring. • 2312 Carter Street in Wilmington. In March, DOJ filed a complaint alleging that illegal drug sales and other violent crimes (including a shooting) had occurred at this row home in Wilmington. The case was resolved in May with the property owner agreeing to ban specific tenants from the property, screen all new tenants for criminal histories, and to hang a sign on the property notifying the public that particular individuals were not permitted on the property. • 837 North Spruce Street in Wilmington. In August, DOJ filed a complaint alleging that the property was a focus of drug sales in the area, and that the Wilmington Police Department had been called to the property 88 times since 2011. The case was resolved in September by agreement of the owner/landlord of the property. The court order requires, among other things, that the landlord evict all current tenants from the property and not rent it to anyone who has lived there at any time since 2012, to specifically ban particular individuals from being on the property, bring the property into compliance with city code before allowing anyone else to move in, not to rent the property to persons with a felony criminal record for a period of five years, and have a ‘crime free’ clause be part of any lease for the property. • 2614 Thatcher Street in Wilmington. In August, DOJ filed a complaint alleging that the property had been a center for drug activity in its neighborhood for years, with some of the activity involving the property owner’s adult daughter. The property’s owner has signed an agreement with DOJ which prohibits her daughter from being on the premises, prevents the owner from renting it to convicted felons for a period of five years, and requires her to sell the property if additional criminal nuisance activity occurs. • 910 Clifford Brown Walk in Wilmington. In April, DOJ entered into a consent agreement with the owner of 910 Clifford Brown Walk to resolve a Complaint that was filed against that property in December, 2015. The Complaint alleged that the property was a center of drug dealing in the community, and also listed a litany of violent activities that had been committed by persons residing in the residence, in or around the residence. The order entered in April banned specific individuals from the property and a specified zone around the property, and prohibited the property owner from renting the property to convicted felons for a period of five years. • 39 Holden Drive in in the Rambleton Acres development of suburban New Castle County (just across Route 273 from an elementary school). Last month, DOJ filed a complaint alleging that the New Castle County Police have been called to this property 34 times since 2013, primarily for complaints involving drug dealing. The New Castle County Police have made multiple arrests at the property arising from drug activity. The complaint is currently in litigation in the Delaware Superior Court. • 118 Unity Lane in Greenwood, Delaware. Last month, DOJ filed a complaint against this property, which is completely encompassed by trees and thick foliage. The complaint alleges that Unity Lane itself is riddled with potholes that were intentionally created by drug dealers to make it difficult for law enforcement officials to respond to calls on that street in a timely way. The complaint alleges that wiretaps established by the Delaware State Police prove that the property, which is in an area known as “The Hole,” has been regularly used for the sale of cocaine. The complaint is currently in litigation in the Delaware Superior Court. • 2101 North Pine Street in Wilmington. In April, DOJ filed a complaint alleging that this property is a residence for multiple violent criminals, and that the Wilmington Police Department has been called to the property 47 times since 2012. Both guns and drugs have been found at the property. After unsuccessful efforts to persuade the property owner to agree to voluntarily abate the nuisance activity, this case is proceeding through the Superior Court process. • 1107 Washington Street in New Castle. In May, DOJ filed a complaint documenting the fact that drug activity and prostitution were occurring at this property, located in a densely populated area of New Castle close to a number of schools and churches. The property owner has failed to respond to the Complaint, and the state has a motion pending before the Court for a default judgment that will find that a criminal nuisance has occurred and order that it be abated. • The Gold Club (1031 South Market Street in Wilmington). Last November, DOJ filed a formal complaint against The Gold Club, located on South Market Street in Wilmington. The Gold Club had been the location of a number of shootings, and had required the Delaware State Police to respond to 237 calls since January 3, 2012. The case was resolved in May, with a court-approved agreement between DOJ and the property owner that the property would be closed, would not be reopened by any business in which the current property owner had an interest, and could only be reopened without the court’s permission if it was sold to a new owner. Even in cases where no formal action is filed, contact from the Department of Justice can be extremely effective in abating criminal nuisance activity usually with property owners agreeing to evict tenants or make changes. Earlier this year, the Department of Justice informed the owner of a Milford commercial property leased to a bar known as Longshot Sports Bar and Billiards that it intended to file an action against the property based on criminal nuisance activity occurring there on a regular basis. The property owner evicted the bar. After the bar’s eviction, the Milford Police Department reported that it had enjoyed its first weekend in two years without a call from the property. On top of the 38 properties addressed above, another 44 properties are currently being evaluated for potential criminal nuisance action, and 31 have been investigated but determined not to be appropriate for criminal nuisance enforcement. Citizens who wish to have the Department of Justice investigate a potential criminal nuisance property should call (302) 577-5093.